OK I had time to finish this post quickly. I just had to add the pictures. When we moved to Seattle I was blessed with an awesome visiting teacher. When she asked my husband my husband if there was anything she could do for me he replied that we were on the hunt for meals that were fast but also easy. Note: she intentionally asked him, knowing full well I wouldn't ask for a thing. A few weeks later she dropped off one of her favorite books that she got for me. Seriously - so awesome! The book? Cooking Light: 5 Ingredient 15 Minute Cookbook. This is my kind of cookbook. Seriously. Every recipe has a full-page picture! Not many books can boast that. Each recipe also includes a meal plan including side dishes and the order to do things. How awesome is that?! Then, down the side of the page is a quick grocery list. You don't have to read through the recipe to figure out what you need. It also includes the per serving calorie, fat, ect. amount. 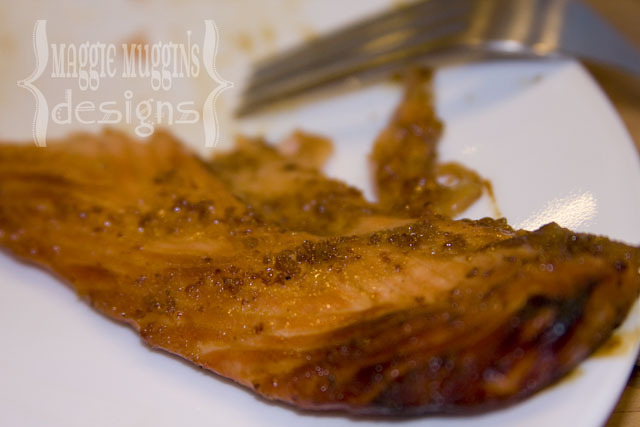 So one of my new favorite recipes in here is the Grilled Honey-Balsamic Salmon on page 29. It's fast, easy and delicious. But the best part of it - my three year old ate it! I'm not kidding - we didn't force it down his throat, we didn't even bribe him to take a bite. It was just sitting there on his plate among the other foods we knew he would eat and he picked it up and took a bite. Then he kept eating it! And we're talking about a toddler who is VERY PICKY. I won't even begin to tell you all the drama we've had with this boy and good. So - I decided to share the recipe with you today. Combine first 5 ingredients in a bowl; brush mixture over fish. Coat grill rack with cooking spray; place on grill over medium-hot coals (350 to 400 degrees). Place fish on rack, grill, covered, 2 to 3 minutes on each side or until fish flakes easily when tested with a fork. *We didn't have propane for our BBQ so we broiled the fish on a broiler pan in the oven for a few minutes on either side. If that isn't enough, I'm going to share with you some very important trade secrets. I know and you know that renaming something does not change it. But a toddler doesn't get that concept yet. Mashed Up French Fries is a favorite for our son, but call them Mashed Potatoes and he will make a grimace at you. I'm not kidding. We have tried the renaming idea on a few other things and it has actually worked. French Toast? Grimace! Pancake Toast? Yum! But - here's our new favorite: Orange Fries. No they aren't Sweet Potato Fries. 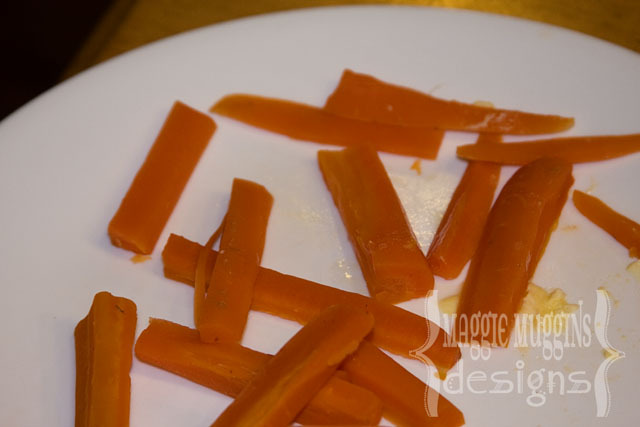 They are just steamed Carrot Sticks. Who'd have known that a new name would cause my son to eat more than his fair share of carrots. Of course, they do have to be buttered and salted too. I'm craving that fish right now! Looks delicious. And I love the simple recipes idea. We need more of those. My husband is the cook too so usually I don't have to worry about it. Great ideas for picky eaters too! I never would have thought of that, but then again I don't have kids yet. I'm sure you get all kinds of creative once you're a mom. HAHAHAHA! That's awesome. Orange Fries....that's just so awesome. BTW That Salmon looks devine! YUM!